August 15: #FirstWorldProblems: There's Nothing to Eat in This House + A Solution and Donation Opportunity! I don't know about you, but sometimes in the days leading up to payday food is a little…sparse. It's not that we don't have money in the bank, it's just that the money left is often allocated for other things. I tend to blow through the food budget more quickly then I should and am usually left with a meager amount to work with the last week before payday comes around again. So I opened up the refrigerator last night, and I panicked a little at the sight of the scanty food sitting inside. We were out of eggs, cereal, bread, oatmeal, and fruit. The bag of all-purpose flour contained an amount so insufficient as to even coat some chicken breasts. What in the world are we going to eat for breakfast, let alone the rest of the day?? We have nothing to eat. There's no way this is going to work. We really need to run to the store. And I wasn't the only one who noticed the shortage of sustenance in the house--a couple of the kids had already chimed in earlier that day about a needed trip to the store. As I was standing in front of that open refrigerator door, worrying about what to feed everyone the next 24 hours, I heard the Lord break through the cosmos and gently whisper to me: There's plenty of food in your refrigerator. It's just not what you want to eat. I feel like I've been learning a lot from the contents of my refrigerator lately. But that's totally and completely true. 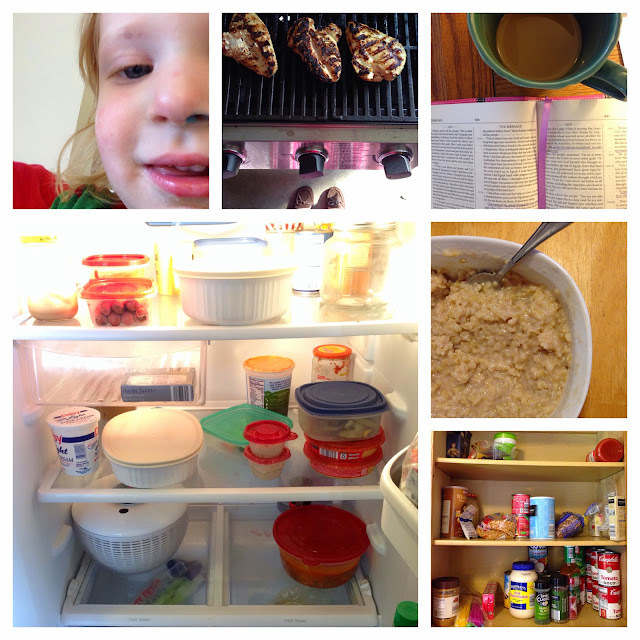 I was convicted in that moment as to how often I run out to the grocery store prematurely to satisfy mere wants instead of using what we already have in the house first and being satisfied with that. With only a day left before payday, I was convinced we needed to make it work. So I shared my concerns with my husband, particularly about breakfast because I was at a loss, and told him about my conviction experience. He opened the pantry, saw the bag of brown rice and suggested rice pudding. We had two cups of milk left, a bag of rice, sugar, vanilla, and cinnamon. So he made the rice pudding that night and the kids had it for breakfast this morning. You would have thought it was Christmas morning!! They were so excited and couldn't stop talking about how good it was. 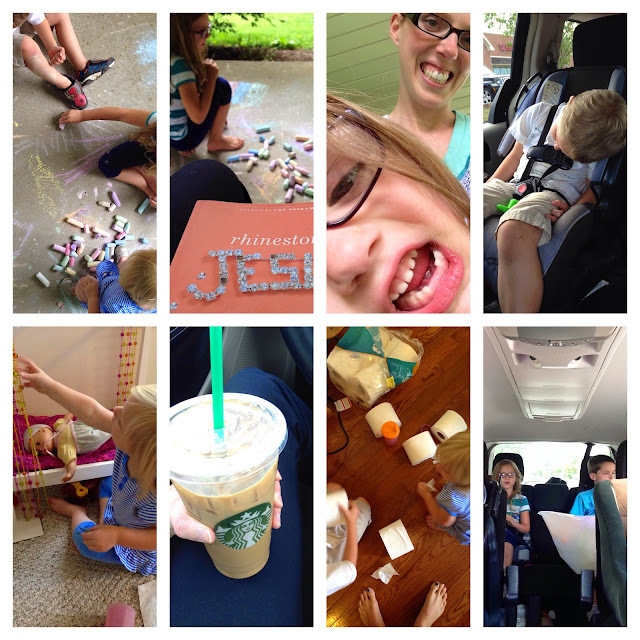 It was a special treat and a fun memory of God providing in what we already had around the house. We wouldn't have had that experience had we run out to the store for a box of cereal. #FirstWorldProblem: I'm hungry, but not for any of the food in my house. #FirstWorldSolution: Don't become a slave to your wants. Use what you already have in the house. If you're not going to use what's in your pantry, donate it to someone who will. Today. How does it help the starving children around the world for me to eat what's already in my house instead of buying more? That's an excellent question. I'm glad you asked. But what this does do is put things in perspective. I can now see my pervasive desire to have more then my basic needs met. I'm living on an entirely different plane where I expect my wants to be met, as well. The result of this extends far beyond food. Sure, we have pantries full of food we never get around to eating, refrigerators full of leftovers and half-consumed jars of whatnot that eventually get tossed. But we also have closets stuffed with clothes we don't wear and basements filled with things we don't use and garages that are so overflowing that we actually have a season in this country each year where we try to sell them. The whole garage. So no, it doesn't help the starving children in Africa right now. But what if we bought less food for ourselves and instead concentrated on using what we already had? What if we bought less stuff in general? That would inevitably free up money we didn't realize was there, which most definitely COULD feed at least one child. Feed Their Future is an opportunity for Bright Hope Allies to join with our partner in the Mathare Valley slum of Nairobi, Kenya to feed and educate 1,400 students, support their teachers, and promote sustainability initiatives. Campaign ends September 1st!! A one-time gift of $136 will feed and educate one child and provide her teacher with benefits for a year! For $22 a month you can help feed and educate two children and provide their teacher with benefits for an entire year! 2. Pray for the students in Mathare Valley, specifically for a way out of the slum and sustainable funding for the programs that support them. 3. Share Bright Hope’s Facebook posts on your social media sites to get others involved. And if we all just fed one child… we could change the world, one life at a time.